Note: this is an essay written in 2003 about my recollections of Thurman Munson, the great Yankee catcher who died in a plane crash in Canton, Ohio in August of 1979. For some reason I thought it was poignant today. Thanks for indulging me. 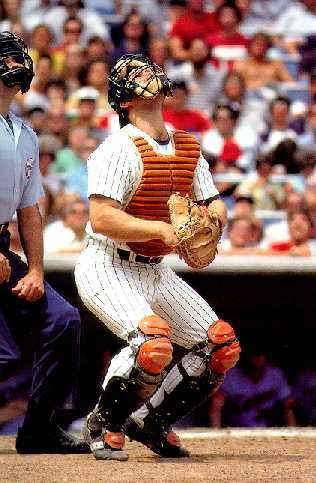 It's kind of odd, how clearly I remember the day Thurman Munson died. In fact, the moment I heard the news on the radio that late summer night in Laurel, Md. during 1979, is probably one of the most memorable baseball memories I own. And trust me, I have a lot of baseball memories. "Reports out of Canton, Ohio are that Thurman Munson, the All-Star catcher and captain of the New York Yankees, died tonight in a plane crash. Munson was attempting to land his single-engine plane when he lost control of the craft at a small airport in his hometown. The Yankees and the O's are scheduled to play tomorrow night at Yankee Stadium. So far, there is no indication that the game will be postponed." Tears. Waterworks, actually. Big, bearded and burly Thurman was dead. How could that be? He was supposed to play against the Orioles tomorrow night. Sure, was clearly beginning the downside of his career and had seemingly given up his catcher's spot to Jerry Narron so that Billy Martin could keep his bat in the lineup by using him at first and right field, but he was Thurman Munson. Never mind that he looked like Ron Jeremy after an intense work over at the spa, he was the catcher for the Yankees. They had just won the past two World Series. He was the captain. He couldn't be dead. Reggie Jackson, the anti-Thurman, was the one bad things were supposed to happen to. Reggie was the villain, not scrappy Thurman, with his cap flipped upwards beneath his catcher's mask and dirt all over his pinstripes. Anyway, I remember my dad – always awkward when dealing with any displays of emotion – trying to console me as I cried for the dead ballplayer in my tiny room of our three-bedroom apartment. I never knew of anyone who had ever died before, even though I heard a story about the Angels' Lyman Bostock getting shot. My dog and John Lennon, both killed on the same day, had more than a year left to live, and my grandfather, who taught me everything worth knowing, hadn’t yet been diagnosed with cancer. It was still a full seven years before I learned what real loss felt like. Hey, I wasn't even a Yankees fan, but Thurman was a player. Actually, he was a decent player and that meant he was as good as a member of the family. Why shouldn't I cry for him? "Thurman's probably playing in heaven with all the great players," dad said. "I bet they have a game going right now." Hey, give him credit. He never knew what to say to me. The next day was a blur, but I clearly remember Scott McGregor spinning a six-hit shutout to be the shocked Yanks. The most memorable part, excluding John Lowenstein's homer to left off Luis Tiant in the 1-0 victory for the Orioles, was the stark and austere memorial before the game. Bob Sheppard, in his distinctive monotone, spoke about the dead captain while the camera above home plate focused on tight shot of the deserted catcher's box. Thurman used to squat there. Then I think I remember a TV announcer – it may have been Chuck Thompson or Brooks Robinson – mention that Munson had been riding a rough 2-for-24 before his death. Recently, in a case of morbid curiosity, I looked it up, and learned that Thurman really struggled during his last month. Through July, he hit just 23-for-91 with one stinking homer and a handful of RBIs, though Martin never moved him from the top of the order. Though he was coming back from an injury and wasn’t catching like he used to, Thurman still hit second and third in the order. I think about that day a lot. Last spring I was chatting with Jason Giambi in the visitor's clubhouse at Jack Russell Stadium in Clearwater, Fla. not with the thought that Reggie, Mickey, Whitey and all of the other Yankees had used that room, but rather that Thurman Munson probably hung his clothes up in one of those stalls. Later that June, after spending the day chatting with Scott Rolen before his Cardinals got their heads kicked in by the Yankees in the Bronx, I decided to take a tour of the deserted Stadium. With no one else to see or chase me out of what Yankees fans so arrogantly call The Stadium and into twilight of the South Bronx, I toured the old yard. I stood on the mound, walked out to center field where Joe D. and Mickey patrolled, and walked along the warning track into Death Valley. Next, I went into the double-decked bullpens, pocketed a ball that was left behind and strolled over to the adjacent Monument Park. All of the greats are memorialized there. I rubbed the Babe Ruth plaque like Roger Clemens did prior to getting his 300th win the night before. I read about Lou Gehrig and Miller Huggins and took in the neatly manicured landscape. But there, on the back wall next to Joe McCarthy, was a plaque for "The Captain." I walked over for a closer look and before I could focus on the words, my thoughts took me back to 1979 and that night without baseball in early August.